A Thorough Account Of The Theory Of Electronic Transport In Semiconductor Nanostructures. Recent advances in semiconductor technology have made possible the fabrication of structures whose dimensions are much smaller than the mean free path of an electron. 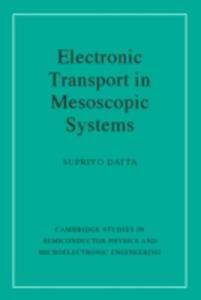 This book is the first to give a thorough account of the theory of electronic transport in such mesoscopic systems. After an initial chapter covering fundamental concepts, the transmission function formalism is presented, and used to describe three key topics in mesoscopic physics: the quantum Hall effect; localisation; and double-barrier tunnelling. Other sections include a discussion of optical analogies to mesoscopic phenomena, and the book concludes with a description of the non-equilibrium Green's function formalism and its relation to the transmission formalism. Complete with problems and solutions, the book will be of great interest to graduate students of mesoscopic physics and nanoelectronic device engineering, as well as to established researchers in these fields.